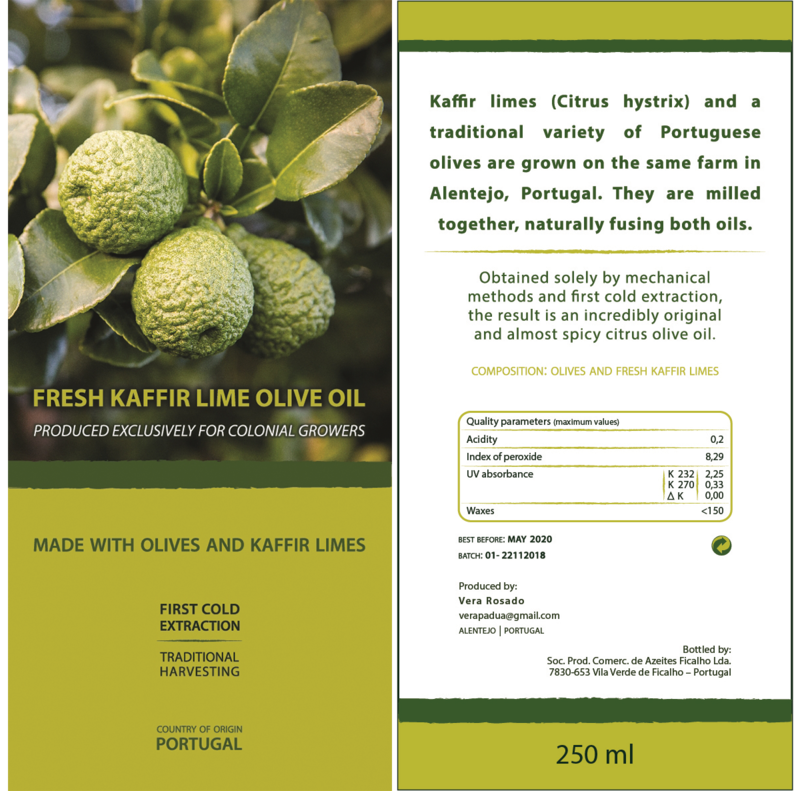 Colonial Growers are pleased to be able to offer an entirely new unique kaffir lime flavoured Olive Oil which is not currently available anywhere in the UK. 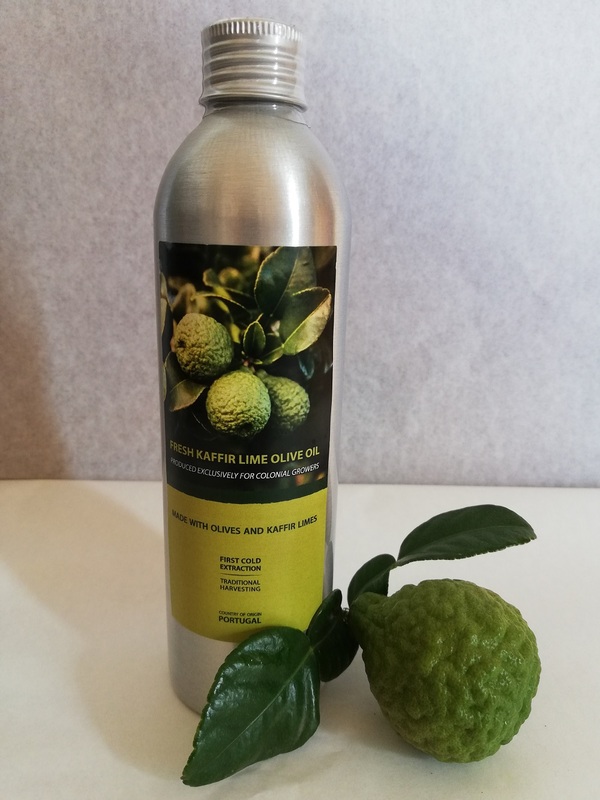 The product comes in a 250ml metal container and will be sent to you by first class post and those of you familiar with the taste of kaffir lime products will, we are sure, be delighted with its wonderful aroma and taste. The oil is manufactured exclusively for us in the Alentejo region of Portugal using organically certified good quality olives and kaffir lime fruit grown on the same farm and harvested using traditional methods. The two products are milled together, naturally fusing both oils at first cold extraction and then filtered and the end product is a wonderful tasting, slightly spicy olive oil. Customers who have tried this product are universal in their delight at it's taste and flavour and many have said that when mixed with pure lemon juice or balsamic vinegar it makes the most delightful salad dressing. How the Kaffir Lime Olive Oil is made. Both the Olives and the Kaffir Fruit are harvested at their optimum point of maturity. Both products are then delivered to the Mill in the shortest possible time during the same day of harvesting to prevent oxidation of the fruit. This is only possible as both products are grown on the same farm. The oil is then extracted by a physical process at first cold extraction followed by filtration. The end result of this process is the purest oil from the healthiest and chemical free products from our own varieties of ancestral olive trees and kaffir lime trees, grown traditionally. Purity of the finished olive oil is preserved during the processing at all times. Need more information or help ordering your Kaffir Olive Oil? Get in touch with us. We would be happy to answer your questions. We pride ourselves on our service both before and after sales. We now offer Kaffir Olive Oil for sale to UK customers as well. Be sure to have a look.